We are designing and constructing a support system to aid disabled children with walking on a treadmill. Our group met with physical therapist Melissa Draper at Cookeville High School discuss the design of a treadmill harness. Ms. Draper requested that such a harness be able to suspend children from about thirty to eighty pounds over a treadmill, allowing them to walk without the fear of falling down. This is a job that Ms. Draper currently performs herself, or with the aid of a child’s walker and some wooden blocks. However, our harness will be much safer and easier on Ms. Draper’s back that the current option, allowing the children to walk for as long as they want. The harness must also adjust to fit children of different sizes and adjust to fit over full-sized and pediatric treadmills. While at Cookeville High, we had the opportunity to meet one of the children who would benefit from our device, a three-year-old boy named Sebastian. Among other difficulties, Sebastian has trouble walking, and often uses the treadmill with Ms. Draper’s help. Our harness will give Sebastian the independence to walk on the treadmill all by himself. Up to 5 feet in height. Hold up to 100 lbs. Fit treadmills up to 37 inches wide. 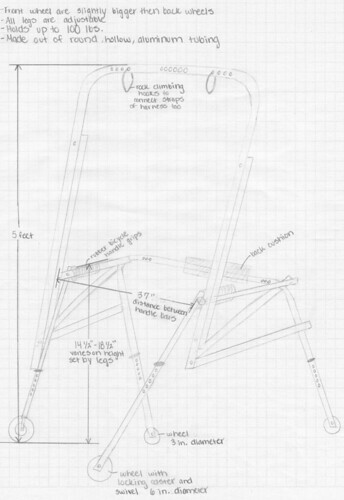 Design #1 features a durable folding frame with a supportive back cushion for comfort. Rubber bicycle grip handles give the child a place to steady himself, and locking rubber casters insure that the frame will stay in place when in use. The legs adjust to accommodate children of different heights using a spring pin type slider commonly found in walkers. Rock climbing clips are attached to the top of the 5-foot frame to allow a harness to attach. These clips can be moved horizontally to accommodate children of different widths. The frame also features round, hollow aluminum tubing that make the frame both sturdy and lightweight. When not being used as a treadmill support frame, this design doubles as a walker. 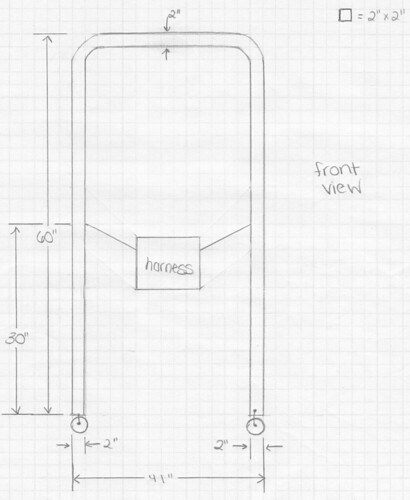 Design #2 has a rigid, rolling frame with locking casters and adjustable/removable handlebars. These handlebars raise and lower using a spring- pin type mechanism and are bidirectional. Because this design can be used as a walker, bidirectional handlebars allow the child to walk with the unit and turn around without having to spin the unit around 180°. The unique aspect of this design is its pulley system to raise and lower the child to the correct height. This design, however, does not lend itself to folding and may require a larger amount of materials to build. 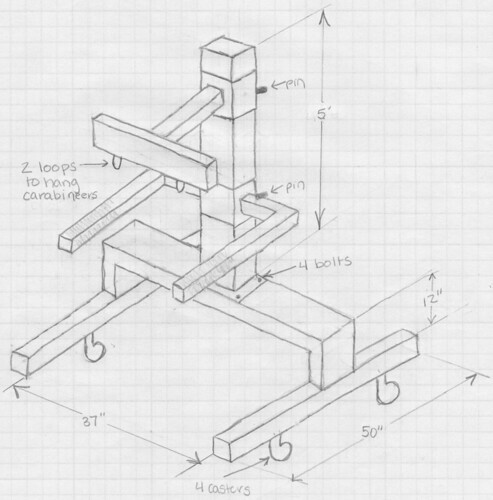 Design #3 is a simple design for a support harness that straddles a treadmill. This design can also double as a walker. It can be used with the child facing away or toward the frame. A T-frame is attached to the main frame and can telescope to allow the main frame to accommodate different heights, ranging from 1 to 5 ft. The main frame is kept at the desired height by a removable pin. At the end of the T-frame are two hooks on which to attach 2 carabineers for the harness. It has two handles for the child to grip while he or she is exercising. The handles can, also, be moved up and down by telescoping, and they too are held in place by a removable pin. The main frame is bolted to the base with four bolts. The base has four locking casters. Design # 4 is a minimalistic design featuring a simple folding frame for great utilization of space when not being used. Locking castors keep the frame in place when the child is using it as a treadmill frame and are free to roll when using it as a walker. However, this design does not have handles, which may present a problem of stability for the child. 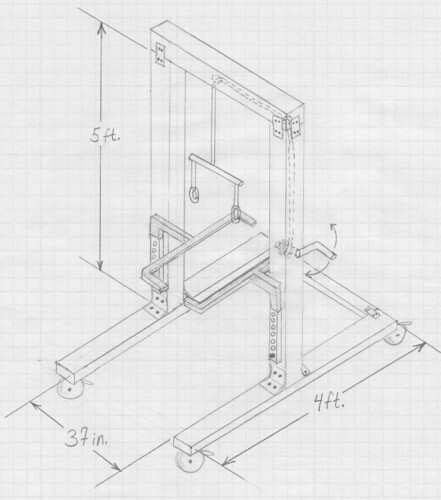 The frame is five feet tall and will use a bungee type harness to eliminate the need for specific height adjustments for different children. Even though design #1 got the highest score on our matrix, we fell that #4 is a better overall design. It got the highest score in 3 of our 5 categories, including folding, size, and amount of material. However, it scored really low on ease of adjustment, and it doesn’t have handles for the child. 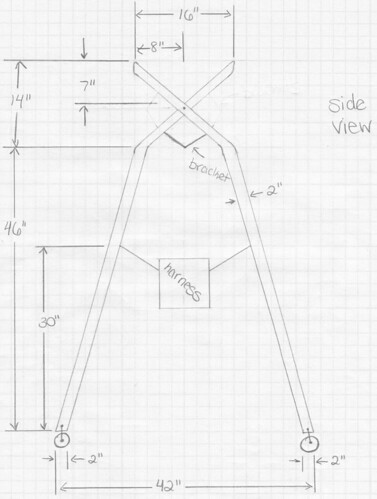 To improve design #4’s score, we plan to attach the harness on a top horizontal bar that connects two A-frames, as well as add adjustable handles. Our final design is made of aluminum tubing and has two A-frames connected by a single straight bar. The A-frames make a 90-degree angle with the top bar and the ground. The top of the A is a 45-degree angle. At the bottom of the A-frames, a bar is attached to keep the A at the desired 45 degrees. The connecting bar is held in place with a bolt on one side and removable pin on the other to allow the frame to collapse. Attached to the inside of the front leg of each A-frame is another piece of piping used as a slider for the handlebar. Each leg of this U-shaped handle bar, which has a smaller diameter than the piping used for the rest of the frame, is placed inside the slider pipe. In order to make the handle bar adjustable, the handle bar will be held at the desired height with a removable pin. To make the handle bar closer to the child, the U-shaped bar will be bent 19 inches from the bottom at a 113 degree angle. The handle bar will be covered with foam to make it more comfortable for the child. Finally, each leg of the two A-frames will have a locking caster attached. We have chosen to do a force analysis, mobility, deformation analysis, and a shear and moment diagram. We think it is important to do a force analysis in order to choose the best material to meet out needs: one that will hold a weight of up to 100 lbs, and one that is lightweight. Mobility was important because our frame shouldn’t move when in use (with the wheels locked); therefore, it should have a mobility of zero. Also, we did a deflection analysis to make sure that our chosen material would not deflect a significant amount when fully loaded. Lastly, we did a shear and moment diagram to see where our frame would most likely fail (given a large enough load) so we can pay special attention to those areas. Note: Both sliders act together as a single connection. We looked at McMaster-Carr, but realized we could save over a hundred dollars by buying most of our parts at Lowe’s. There are a few things that Lowe’s doesn’t carry, so we have to order those items from McMaster-Carr. Our frame is able to be fully or partially disassembled for storage or transportation. From its fully disassembled state, the frame is very quickly and easily assembled, as shown below. For deconstruction, simply follow these instructions in reverse. Make sure all casters are in their locked position before beginning. Locate the tube marked "RI" and slide it onto the top bar side marked "R". Locate the tube marked "RO" and slide it onto the top bar side marked "R". Locate the tube marked "LI" and slide it onto the top bar side marked "L". Locate the tube marked "LO" and slide it onto the top bar side marked "L". Locate the tube collars and insert them on to both side of the top bar. Tighten the tube collars with a wrench. Screw both end caps onto the ends of the top bar. Insert the large clip into the hole in the pin. Repeat for the other side. Line in up and slide it into the sleeves. Place handlebar at desired height and insert the pin through the hole in the sleeve to match up with a hole in the handlebar. Insert clip and repeat for the other side. Our design has undergone a number of changes from the final design for various reasons. Perhaps the most notable change is one from aluminum to steel. And while aluminum provided several material qualities we were looking for, steel won out as a better choice. It was much cheaper and stronger than equivalent-sized aluminum tubing. And while we had turned to aluminum for its lightweight and subsequent easy of handling, we realized that a heavier steel may actually be safer as it would make the frame less likely to topple. Another notable augmentation includes a revamped method of attaching the frame legs to the top bar. We had planned to use a welded plug with a threaded rod on each the end of the top bar, onto which we would bolt the legs. However, this would seem to have put undue stress on the threaded rods. Instead, we have allowed the strong top bar the carry the full load by way of the use of T connectors welded to each of the legs. The legs are now slid onto the top bar and held in place with t-bolt tube clamps. In order to avoid drilling through and potentially weakening the top bar in order to connect eye bolts, we have attached shackles with attached high-strength carabiners from which to attach the harness. Locking casters are attached to the legs by screwing them into a welded metal plate. The dimensions have changed somewhat due to practical matters, but have no significant effect on the workings of the frame. The frame is now covered in foam for safety. We are very pleased with our prototype. Our design parameters were not only met, but were exceeded in many respects. It can safely hold at least 200 pounds, well over our goal of 100. And with adjustable handlebars, it can easily accommodate both children and adults up to 5'6". It can fit over both pediatric and full-sized treadmills, and it may also be used as a walker. And though it was not a design parameter, the frame may also be used as a swing-set. Finally, the padding will certainly increase the safety aspect of out design.